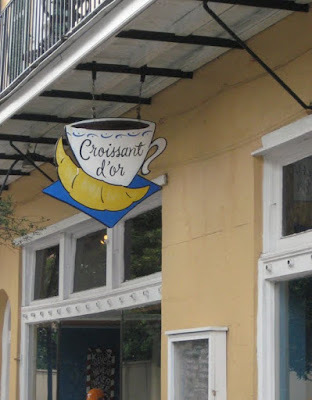 Second stop on our 24 hours of New Orleans food heaven was Croissant D'or Patisserie. 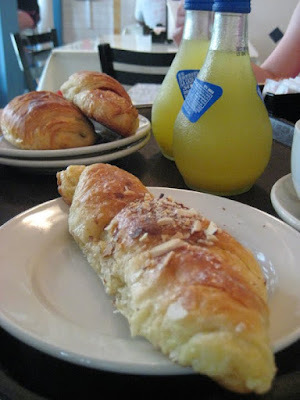 After following recommendations to Angelo Brocato the night before, we eagerly followed another recommendation for breakfast, about 10 blocks from our hotel. Awesomeness was apparent on entry: simple glass case, stuffed with cookies, quiches, and croissants and a gorgeous tiled seating area opening to a lush green back patio. From the street, it's a bit hidden, but inside, this place is totally the bomb. 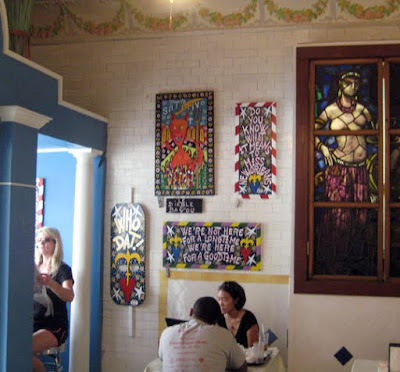 In addition to the classic ornate tiling, there's funky local art perched everywhere on the walls and a giant internally lit stained glass mural over the back wall, and fabulous sky blue window bays. We arrived in style - my little one's first cab ride! - and each chose a different pastry. My family is totally getting used to the Grubbus thing, and happily swapped tastes of each other's eats. Together, we had a cherry danish, and raspberry, almond, and chocolate croissants. The fruit items were good, but the class action was the almond and chocolate. Both of these really let the flaky, buttery, light texture of the croissant shine, and the depth of the chocolate and almond flavors was a perfect compliment to the subtle sweetness of the pastry. The danish and raspberry croissant, while also awesome, played a bit too much to the sweet side, and lacked the complexity of the others. I am in awe of croissants in general - easy in concept, these take a lot of effort to make well - and I was positively blown away by the impossible fineness of these in particular. I had a cup of good dark coffee, and resisted (barely) the temptation to go back up and get another almond croissant all for myself. This is one of the places that serves as proof that somewhere underneath the surface of the French Quarter, there are actually people that live here. I think that's one of the things that makes New Orleans so appealing - it's full of tourists, but it's not designed around them. Locals sustain these amazing places - not full of glitz, not obvious from across the street, but temples to good food, inhabited by people who live here, people who once lived here, and people lucky enough to have been tipped off.